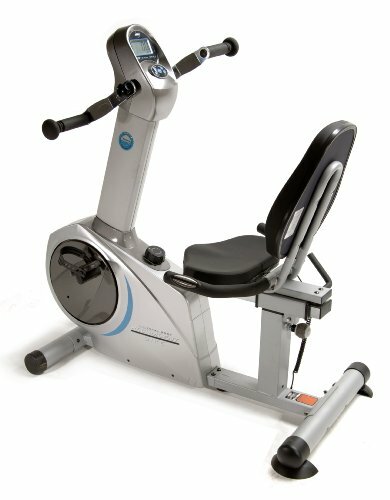 The recumbent bikes with moving arms enable you to workout your upper part of your body along with the lower part of your body. This type of bikes are very similar to elliptical, but the way your legs are worked out is different in these two. 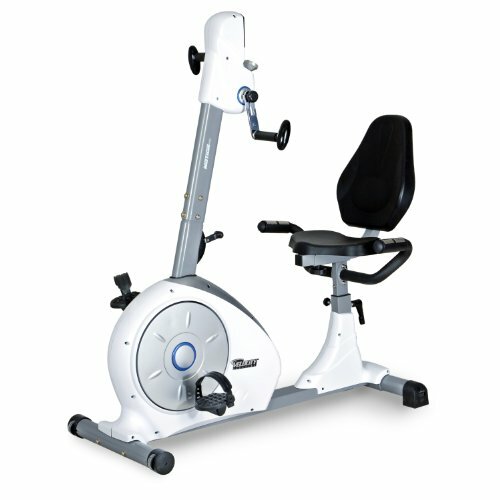 According to our research, the Stamina Elite Recumbent Bike is the best bike with moving arms for most of the people. The best part about dual motion recumbent bikes is that it provides a low-impact cardio workout for the lower part and as well as the upper part of your body. In short, they are best suitable for a low-impact full body workout. In addition, due to the rapid movement of the legs and the hands, it will also work out all the ab muscles, that is otherwise not possible in case of only leg workout. This type of recumbent bikes with moving arms is best suitable for seniors for strength training for the whole body with a light workout. If you are looking for bikes to do high-intensity workouts, refer this article on spin bikes. LCD console displays time, distance, counts, and also the calories. Along with taking a look at the sturdiness, comfort, and the resistance mechanism of the bike, there are some other factors you need to look into when buying bikes with moving arms. If more than one person is using the bike, the knob for adjusting the length of the bike's arm is also essential. 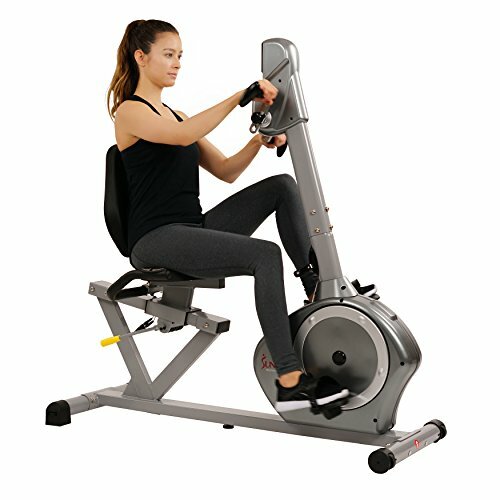 Many of the good dual motion bikes also come with resistance for moving arms, so that you can vary the intensity of your arm workout. The moving arm either comes with magnetic or mechanical resistance. This is a great feature to look for. In some of the bikes, there are separate resistance knobs for both the leg and the arm pedals. In some bikes, there will be an univeral knowb to adjust the tightness of both the pedals to keep things simple. These are some of the crucial features you need to look at while buying bikes with moving arms. Analyzing some of the recumbent bikes in the market, I've picked some of the good bikes that come with moving arms. This recumbent bike is really sturdy with the steel frame and stabilizer bars. This bike won't come with any sort of levelers. Hence, you may need to place this on even surfaces like a floor mat or an even surface. The seat is adjustable both vertically and horizontally. This means you can adjust the height and as well as the nearness of the seat to the hand pedal. For taller people who are above 6.5ft, they need to still fold their knees slightly and can't fully extend their legs while pedaling. However, this is not an issue for most of them. The resistance mechanism is magnetic with 8 levels of varied intensity. The universal resistance knob controls the resistance of both the legs and arms pedals. There are no separate knobs to adjust them, in case if you need them. However, I feel that there's no need of separate knobs. The resistance is quiet. It won't make any noise as there's no rubbing inside. The bike also comes with a simple LCD console. This console displays basic information like distance, calories burnt, time, and others. Only one metric is displayed at the time, this can be toggled by hitting the mode button. The bike also contains pulse sensors and also the display alerts you when your pulse maxes out. The console needs 2 AA batteries for it to run. No other external power source is required. The seat is thickly padded and offers good comfort. As this bike is designed especially to be used by seniors, the seat is top-notch. If you need any additional softness, you may always keep a soft cloth or a small pillow underneath your seat or as a backrest. The angle of the backrest is automatically adjusted when the seat is adjusted horizontally. This feature enables you to easily work out on this bike for hours. Overall this is a nice bike that also comes with variable resistance for arm workout. The bike is also well-built and is durable. The bike is well-built for the price. Looking at the design of the bike, the bike seems to last for a couple of years with no problem at all. The bike comes with two stabilizers that make the bike not to wobble when working out. The back stabilizer can be adjusted so that the bike will be sturdy even on uneven surfaces. The front stabilizer, as usual, contains transport wheels that help in transporting the bike easier. The seat is adjustable both vertically and horizontally. At the closest horizontal adjustment of the seat, the bike tends to be quite uncomfortable for people below 5.4' height. The bike cushion is thickly padded and they adjust to the shape of your back without causing any discomfort. The resistance mechanism is magnetic like most of the recumbent bikes. This along with the belt drive makes the bike totally silent to drive. The LCD console is rather simple. There is only one button, which you can use to change the modes. The various things like distance, calories burnt, time and also the heart rate are displayed by the console. The console needs only 2 AA batteries to run. You can also measure the pulse rate, this can be done by holding the sensors at the side of the bike while riding it. The pulse is not so accurate as like that most of the bikes in this range. The tension knob in front of you can be used to vary the intensity of your arm workout. However, as you may expect you can't measure the pulse rate while doing upper body and arm workout. Because, the pulse sensors will be at the side of the bike. This bike is a newcomer in the market. The bike comes with steel frame along with stabilizers to keep the bike sturdy even on quite uneven surfaces. These don't come with levelers like that of other bikes I reviewed in this post. The seat height can be adjusted by pulling the knob and releasing it to the pre-set holes on the seat pole. There's no option for you to do the fine incremental adjustments. The seat is padded for good comfort. The backrest is also comfortable. The seat is also adjustable to vary the proximity of the seat to the handlebar. So, for shorter people, this is a great feature for convenient longer workouts. The resistance is magnetic. The resistance knob for the leg pedals are marked and have 8 levels of varied intensity. This enables you to vary the intensity of your workouts. The LCD console displays time, distance, counts, and also the calories you have burnt. These metrics help you keep motivated while working out. The handlebars at the side of the seat also have pulse sensors on top, that helps you track your pulse rate. It helps you determine the intensity of your workouts and helps in fat burning. As usual, you can't both track pulse and also do arm workout at the same time. These are some of the best recumbent bikes that have moving arms. These bikes are well suitable for full body low impact workout. The arm workout workouts various parts like lats and the arm muscles. With this additional feature of moving arms, you don't need any additional fitness equipments in your home for the upper part of your body. If you are looking for bikes that are suitable for high-intensity power workouts, spin bikes are suitable for you. However, note that these bikes are only suitable for low-intensity workouts. These bikes are suitable for seniors who need a low-impact cardio workout. Recumbent bikes that come with moving arms are great for working out your upper part of your body. It is well suitable for seniors.